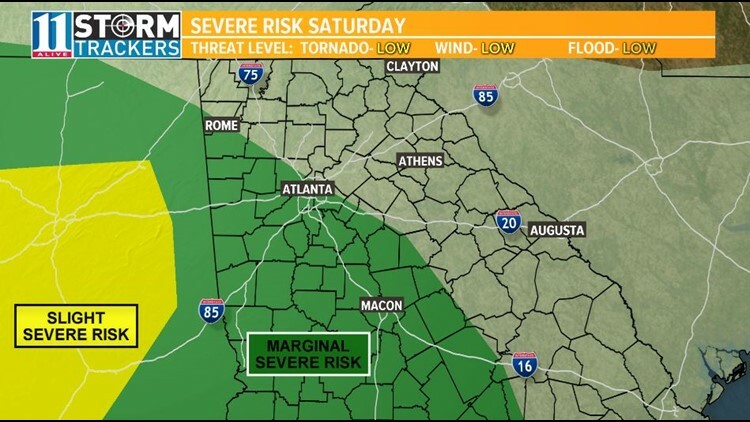 There is the possibility of severe weather on Saturday. 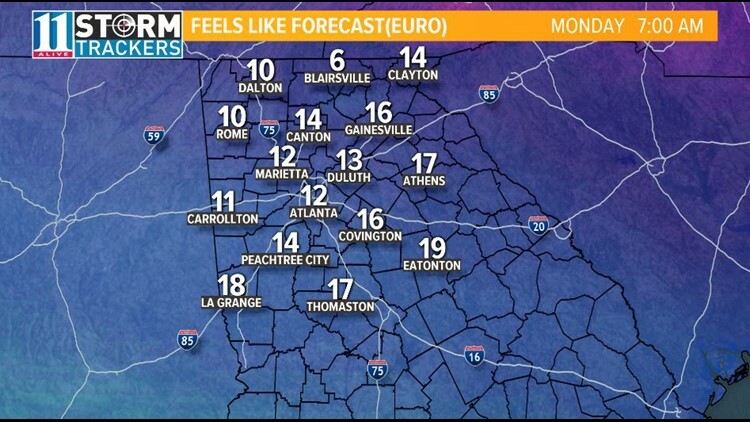 ATLANTA — It's the middle of January and you may be wondering, where is the cold weather? Well, it's on the way. But before it arrives, we have to contend with some showers and storms including the possibility of severe weather on Saturday. 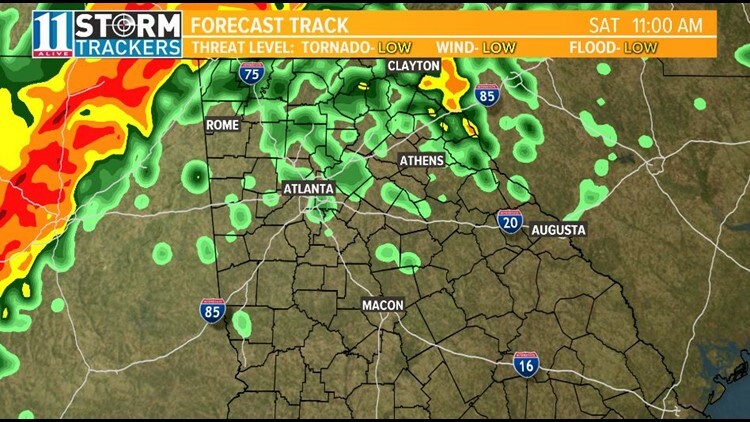 The day overall will be damp with showers beginning in the morning, the threat for severe weather ramps up in the afternoon. 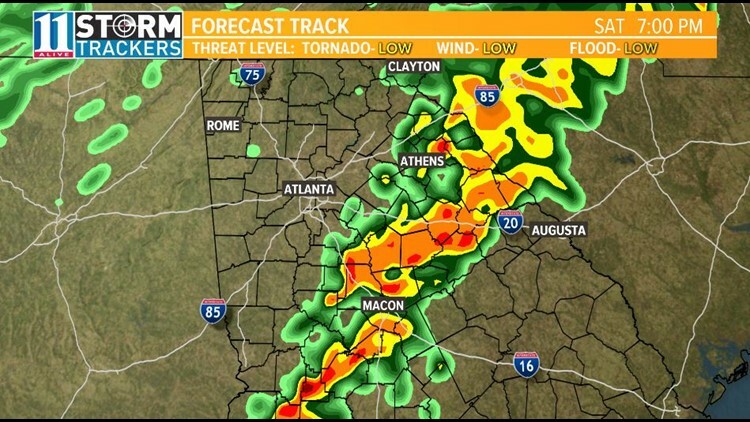 While the greatest risk for severe weather exists to our south and west, there is still the possibility of storms turning severe into the Atlanta metro. The biggest threats will be damaging wind gusts which also comes with the threat for brief tornadoes. Widespread severe weather is not expected, just be aware and vigilant for severe weather warnings if they are issued for your area. 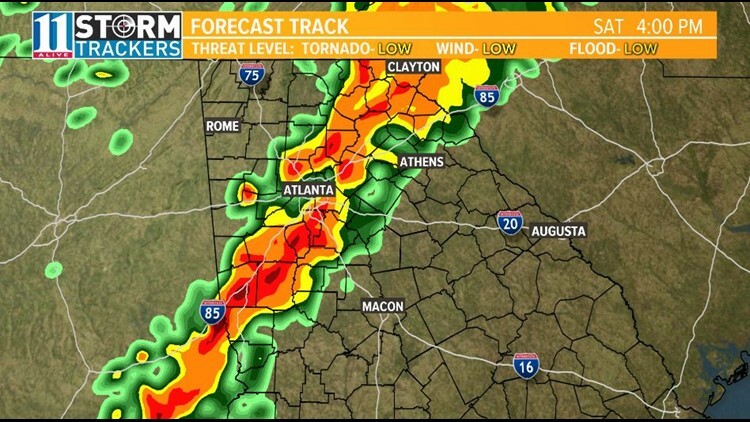 Time of arrival for this threat of severe weather is a little tricky at this point, but it looks to move into the Atlanta metro around the late afternoon and evening time frame. You'll notice Saturday will also be very windy, gusts may reach as high as 30 mph. The wind won't be letting up as that cold air from the Arctic rushes in behind a cold front moving through early Sunday morning. 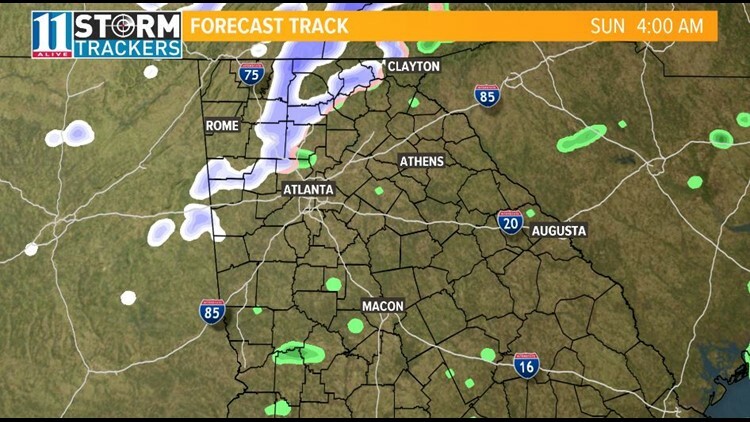 As the cold air moves in and moisture hangs around, snow flurries may mix in with some light rain in the Atlanta metro Sunday morning. Further north, especially in the higher elevations, there may be as much snow to deliver a very light dusting on elevated surfaces. Temperatures will plummet through the day, from the 40s and 50s just after midnight to the 30s by the afternoon. 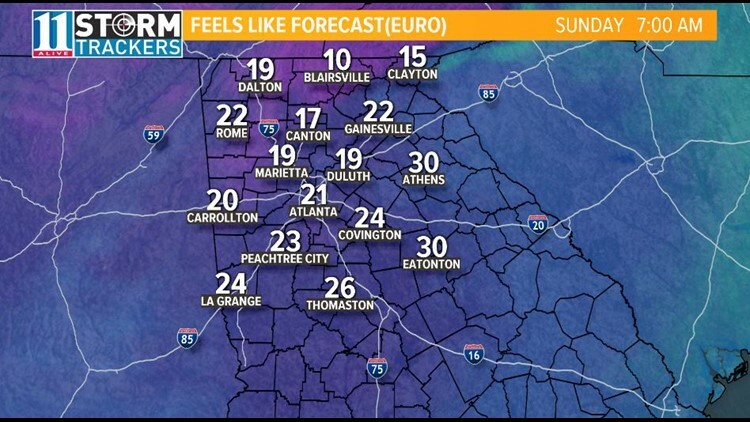 Models are putting out 'wind chill' or 'feels like' values ranging from the single digits to 20s, as a northwest wind may gusts again up to 30 mph. 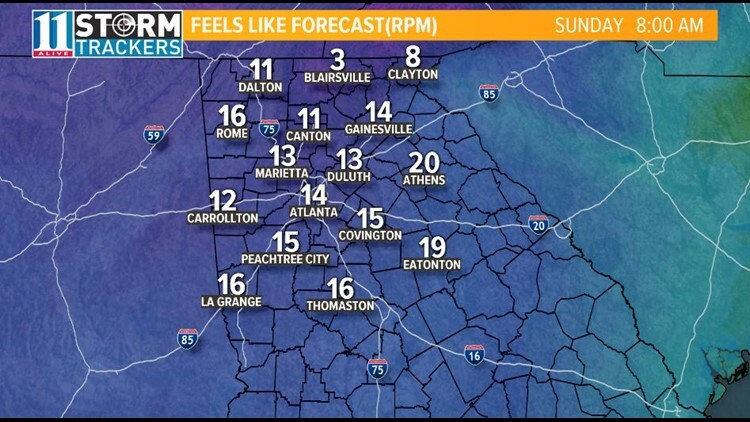 Monday morning, the gusty wind speeds continue and so do the colder temperatures. 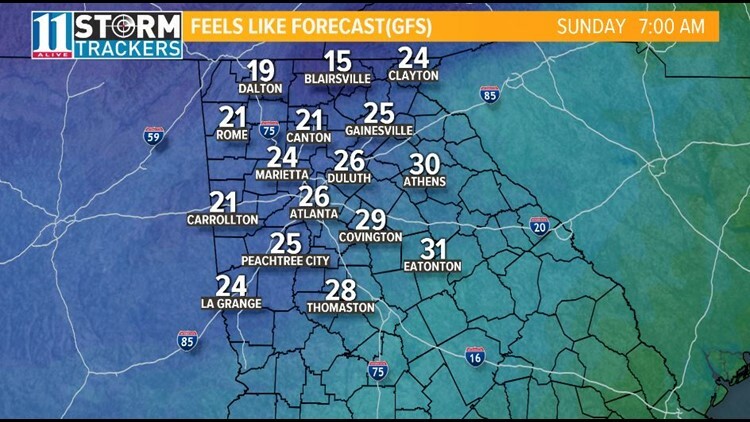 These wind chill values may be cold enough to warrant a wind chill advisory for far northern Georgia where temperatures will be coldest and wind speeds will be highest. 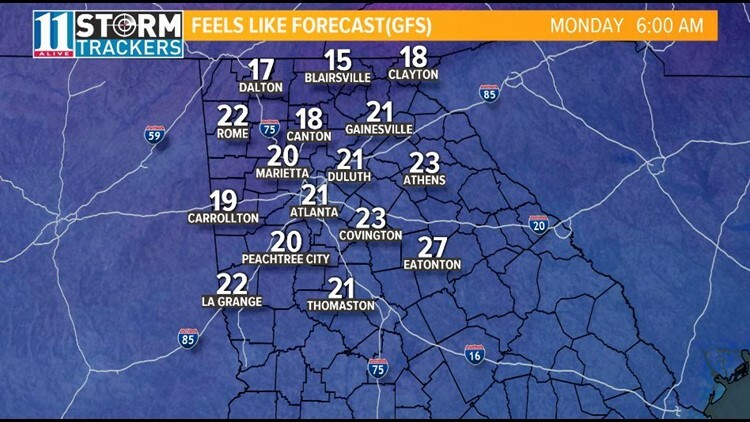 Actual low temperatures on Monday morning look to fall into the teens and 20s, which may deliver the coldest temperatures since January of 2018. The way it looks now, winter is just getting started, and it can only get colder over the next several weeks.